"Mom, don't talk to my friends." Sony Classics has debuted a trailer for indie comedy The Meddler, which premiered at the Toronto Film Festival just last year. Directed by Lorene Scafaria, the film stars Susan Sarandon as a widower who gets a little too close to her daughter, played by Rose Byrne. The full cast features J.K. Simmons, Billy Magnussen, Jason Ritter, Michael McKean, Lucy Punch. 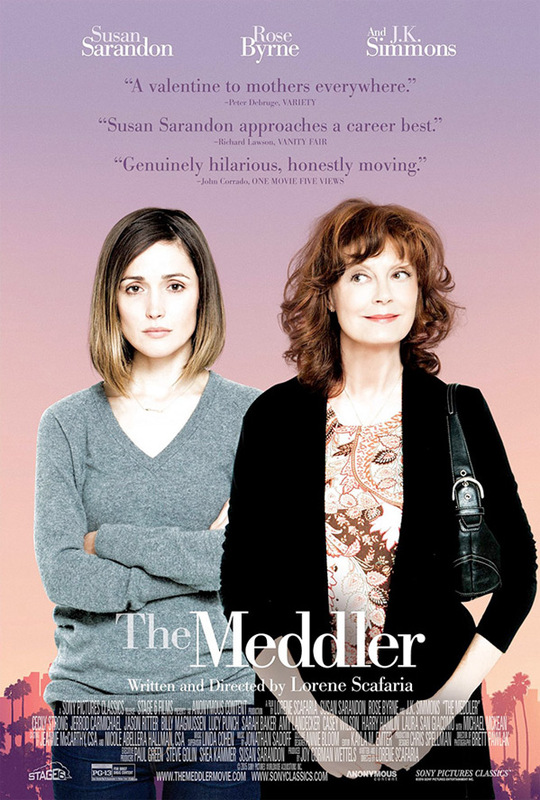 The film did get some good reviews, like this from David Ehrlich: "Imagine if Clueless had starred a 68-year-old Susan Sarandon as an overbearing mother and you’ll have the right idea about Lorene Scafaria’s The Meddler, a sweet and sneakily effective portrait of a woman learning how to re-engage with the world after the greatest loss…"
An aging widow (Susan Sarandon) from New York City follows her daughter (Rose Byrne) to Los Angeles in hopes of starting a new life after her husband passes away. The Meddler is both written and directed by New Jersey-born filmmaker Lorene Scafaria, of the film Seeking a Friend for the End of the World previously and a few episodes of "New Girl". Her latest film first premiered at the Toronto Film Festival last year, and was picked up by Sony Pictures Classics for release here in the US. They'll release Scafaria's The Meddler in theaters starting on April 22nd this spring. For more info visit SPC.com. Anyone interested? did JK Simmons steal Sam Elliott's voice? This looks pretty good, though. Great cast. SEEKING A FRIEND was frankly a huge surprise for me. THE MEDDLER looks surprisingly good as well.